Many people that are new to email have difficulty deciding which field to use when sending email, and so I thought it would be easier to explain by going through some examples. 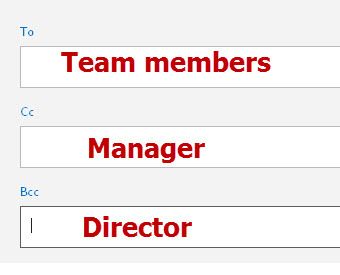 You are sending a work schedule to a team with 5 members and your manager needs to be kept informed. You are sending a work schedule to a team with 5 members, your manager needs to be kept informed,and a director as asked that you keep him in the loop, but discreetly. You are sending a note to a team member (member1) and the rest of the team needs to to be aware of it including the manager. 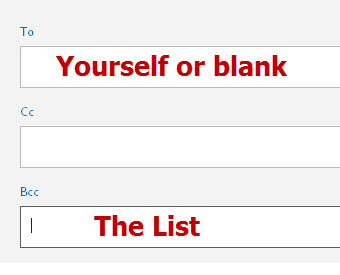 You are sending an email to a very large email list of over 100 addresses. 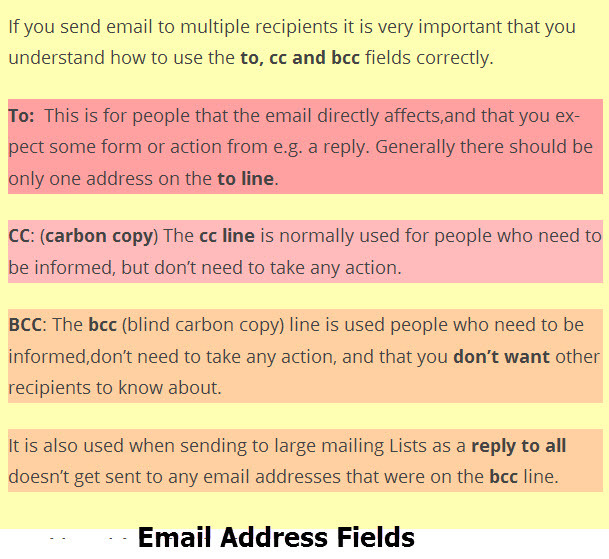 Note: Using the bcc line keeps the list member email addresses confidential, it also guards against possible mail storms in the event that a recipient does a reply to all. Test your knowledge and understanding of email address fields and take the quiz. What Does bcc stand for? You are sending an email to your Mother that has some holiday photos attached,and you want your sister to see it as well. How do you Address it. Check all that are valid. You put you mothers email address and sisters email address on the to line. You put you mothers email address on the to line and your sisters email address on the bcc line. You put you mothers email address on the cc line and your sisters email address on the bcc line. You put you mothers email address on the to line and your sisters email address on the cc line. You are sending an email to a company regarding a complaint. You have been dealing with a customer support representative and have asked for the email address of their manager. You are now going to email the manager to escalate the complaint. How do you address the email? Use the to line for the manager and cc the customer support representative. Use the to line for the manager and the customer support representative. Use the to line for the manager and bbc the customer support representative. 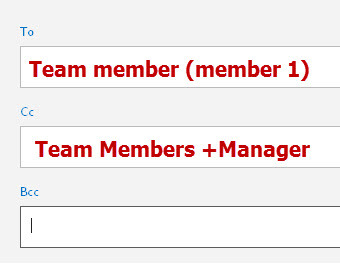 Use the to line for the customer support representative and cc the manager. You are sending an email to your boss about a project you are working on as part of a small team. How do you address the email? 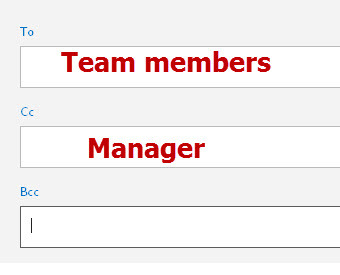 Use the to line for your boss and for the other team members. Use the to line for your boss and the cc line for the other team members. Use the to line for your boss and the bcc line for the other team members. You are the secretary of a sports club and are responsible for sending a monthly email update to all of the members. How do you address the email? Check all valid answers. Use the to line for all club members. Use the cc line for all club members. Use the bcc line for all club members.